Clive Madgwick is established as one of Britain's most popular and commercially successful artists. His clear, detailed style, coupled with an ability to distil the essence of the English landscape, provided him with a strong market for his original paintings and prints. Something which set Clive Madgwick apart from many landscape artists was his desire to represent the landscape in reality, rather than as it was. Consequently, whilst many painters depicted long-since passed scenes of horse-drawn carts at harvest time, Clive Madgwick preferred to turn his back on sentimentality and paint a tractor ploughing a field. Born and bred in the Esher area of Surrey, Clive Madgwick's whole family was medical and, after attending Downs End School and Epsom College, he went on to study dental medicine at Guy's Hospital. The surprise to the family came when he turned from dentistry and became an artist. Wholly self-taught, he turned to painting full-time during his early middle age and consequently pursued a highly successful new career. Major commissions were numerous and included work for the Abbey National Building Society, Calor Gas, and Boots the Chemists. 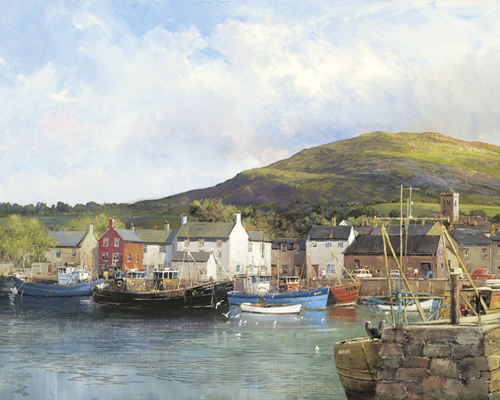 His sensitive paintings were published as fine art prints with such success that Clive Madgwick became one of the best-selling artists in the world. His pictures are held in many significant collections. Her Majesty Queen Elizabeth II owns a 1989 painting Buckingham Palace from St James's Park, which hangs in Windsor Castle and which thankfully survived the fire. Clive Madgwick lived in East Anglia, drawing inspiration from the local countryside to create his paintings and travelling extensively the length and breadth of the United Kingdom. He died in 2005.